Communicate, Collect & Collaborate with Sticky Notes from Tony Vincent on Vimeo. I just viewed this excellent video by Tony Vincent (@TonyVincent) of Learning in Hand that explains the relevance of Padlet (formerly Wallwisher) and Lino, sticky note apps, in student learning. 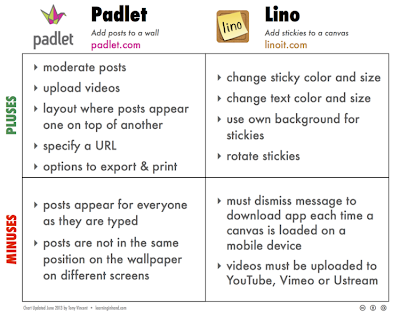 Padlet and Lino are both free apps, available for iOS and Android, that also work on standard web browsers, require an instructor account but do not require students to have accounts. Tony's 15-minute video is thorough, well-paced, easy-to-follow and a transcript is available here. Instructors use one of the apps to create a "wall" or "canvas" to which students individually (or in pre-designated colors for small groups) add sticky notes. The notes can include a simple word, a phrase or sentence, a link, an image, or video! With padlet, instructors have the option to moderate the sticky notes as they are submitted or allow them to appear synchronously. The collaboratively produced wall of sticky notes could reflect brainstorm results, responses to a critical inquiry prompt, links to resources about a topic, links to projects created by students (in Haiku Deck, Google Presentations/Slides, Slideshare, YouTube, etc. ), a collection of images that represent a particular time period or event that could then serve as a visual backdrop for an introduction to a new course topic. Since laptops and mobile devices are supported with Lino and Padlet, there are lots of great ways these tools could activate classtime and, of course, they would be fabulous for blended and online learning, as well. 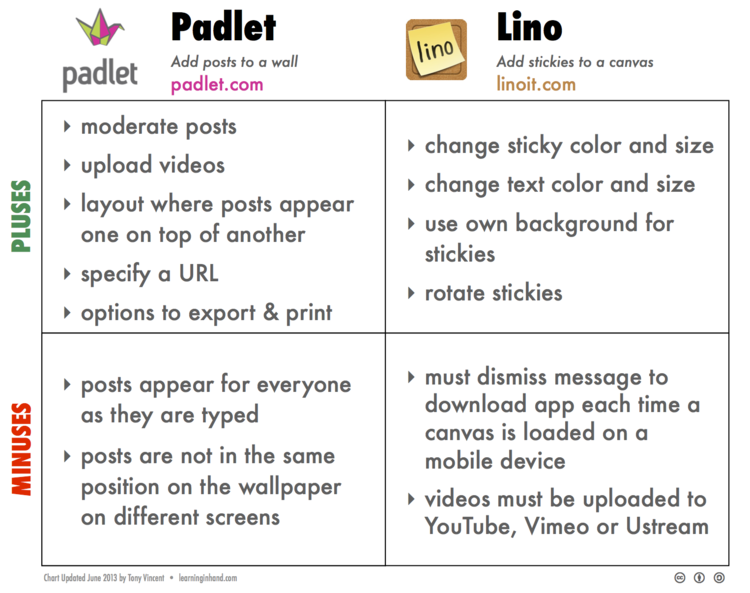 Take 15-minutes to view Tony's video (above or here) and also check out the very, very helpful image below which compares the features of Padlet and Lino. Thanks, Tony, for the great resources!